Geek Speak: All Hail Upchuckus! Ted probably would have been fine, but he stood up a little too fast striking that awesome big-damn-hero pose. Reality can be a harsh mistress. I promise this is the last strip that features Ted vomiting. In the next strip we get to see him in the shower! You think I’m kidding don’t you? So the reason this didn’t get posted for Friday the 7th is it was almost midnight on Thursday the 6th by the time that I finished the rendering work on the comic strip. By the time I’d started the post, added the text above, and started the review below it was well after midnight, and my ability to form sentences was in danger of being seriously compromised. 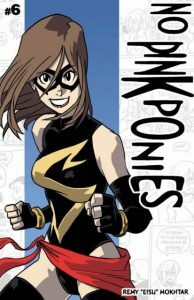 I am really, really pleased to be able to recommend No Pink Ponies as a webcomic that is absolutely worth checking out. The other day I was browsing around Comic Rocket, because I’d read my regular comics and was looking for something different. No Pink Ponies showed up in my recommendations and I distinctly remember thinking, “what the hell, it costs me nothing but a few minutes of my life I’ll never get back.” It’s illustrated by the same person who draws another comic I like, so I clicked the link. The next thing I knew a half hour had slipped by while I was happily unaware of its passing. The basic idea of the strip is that it is a slice of life, geek culture comic strip with a female protagonist at its center. She opens a comic book shop so she can be closer to the cute guy she likes. Shenanigans ensue. The comic succeeds on several levels, but nowhere is that success more apparent than in crafting a female lead with an authentic voice. Jess is delightfully nerdy, adorably neurotic, and charmingly engaging. There are two weaknesses in the writing. Mokhtar is Malaysian, and English is not his first language, so his dialog sometimes comes out a little wonky because the structure isn’t quite right. That’s a minor thing. The bigger sin is that he will introduce new characters, or new information about characters in a way that feels like he’s going back and adding continuity that didn’t exist before. The artwork is in a manga-style and nicely done. It’s stylized without being completely over the top. The line work is precise and the characters don’t ever feel stiff or rigid. The characters are well designed and expressive, which helps to make them identifiable. If there’s a weakness in the artwork it’s that Mokhtar tends to leave the illustration with ink outlines and only the the occasional colored accent, like a tie or a hat. Without some level of color or shading it leaves the strip feeling a little flat. Overall, that’s a minor technical note, and it only applies to the regular black and white strips, not the full-color “Sunday” strips. Another of my favorite cartoonists, Keith Knight, doesn’t draw arms on his characters unless he absolutely has to. We all have our quirks. Mokhtar does something really interesting in No Pink Ponies that I don’t think I’ve seen anywhere else. None of the male character have names. Ever. The strip has been running since February 2006, and he has never revealed the names of the male characters. This has the effect of placing even more emphasis on the female characters, and fixing the male characters into supporting and background roles. Even Jess’ love interest, the guy she opens a comic book store as a pretext to get close to, hasn’t been given a name. It’s effective. You’d think that you’d miss having names for all of the characters, but the way the strip is written it doesn’t matter. The reader accepts that the characters all know each others’ names, and they speak to one another in the way friends do, without having to announce the name of the person they’re speaking with at the start of every sentence. I could continue to gush about this comic for another paragraph or two. It’s characters are charming, grounded, and well established. The overall story is well orchestrated and written in such a way that you find yourself rooting for the main characters. When there is a payoff in the story it delivers in a really satisfying way. I strongly recommend you check it out. This is great reading in the morning when you need a laugh to get your day started, when you need a fun diversion in the middle of a busy day, or just to read for fun when you have a minute to sit and relax.